Below is that part of John's letter objecting to the Mary's Assumption. He gives this as one of the reasons why he left the Catholic Church and joined one of the Lutheran Churches. The rest of the article is my response to John's very pointed objections. I have questions about Mary but I haven't taken the time as you have to seek out the answers. Perhaps you can share some of your insights. Here's where things break down for me. Certainly, Mary had to be a great person to be chosen to bear and raise Jesus. Surely, this must be the greatest honor of all time... The Catholic Church reasons, she must have been bodily assumed into heaven. She was just too good to be rotting in the earth like the rest of us. That is quite an assumption!... Tell me, Lenny, what has your research found? When did this belief in the assumption originate? Did a Pope declare it? Which one? Why wouldn't something of this significance be recorded in the Bible? Mary rotting in her grave. The assumption of Mary is not in the Bible. The Assumption of Mary defined November 1st 1950. The assumptions of Enoch and Elijah. Non-Catholics teach the ascension of Mary. Lutheran minister, why all the fuss about Mary? Where are the Bones of Mary? The oldest records of the assumption of Mary, 100 to 200 A.D.
Rapture/Assumption or is it both? Do Catholics worship Mary as a God? Why do Catholics honor Mary so much? Martin Luther exalts Mary, his "spiritual mother." Mary rotting in her grave: Your statement; She [Mary] was just to good to be left rotting in the earth like the rest of us is not a real objection but a statement of mockery. John, perhaps someone said this to you and not knowing how to respond to it, you simply caved in and concluded that Assumption of Mary is not real. Would you say that Lazarus was to good to be left rotting in his grave when Jesus brought him back to life? The dead man came out (Jn 11:44)? Would you speak this way about the people who came out of their tombs after the death of Jesus? Tombs were opened, and the bodies of many saints who had fallen asleep were raised, And coming forth from their tombs after His resurrection, they entered the holy city and appeared to many (Mt 27:52-53). Were they too good to be rotting in their graves? You should not mock something you do not believe just because it is not the norm. It is true that Lazarus physical body being brought to life after death is not the norm. And it is also true that people coming out of their tombs and appearing to others is not the norm. They are the exception, but that does not mean that they didn't happen. The Assumption of Mary is not in the Bible: Why wouldn't something of this significance [the Assumption of Mary] be recorded in the Bible? John, the Lutheran Church, that you joined, believes there are two sacraments, but where in the Bible does it say that there are two sacraments? Why wouldn't something of this significance be in the Bible? Martin Luther, more than anyone else, fostered his Protestant doctrine of Sola Scriptura (Bible alone) and yet he believed in many things not in the Bible including the concept of two sacraments. The very idea that something must be in the Bible to be worthy of belief comes from the Protestant doctrine of Sola Scriptura. To me, the single most fascinating thing about the Bible Alone concept is that the moment you believe it, you now believe something that is not in the Bible. The Bible does say that Scripture is useful (2 Tim 3:16); however, it doesn't say scripture ALONE is useful. All scripture is inspired by God and is USEFUL for teaching, for reproof, for correction, and for training in righteousness (2 Tim 3:16). People who believe in Sola Scriptura do so because Martin Luther said so. John, do you realize that the moment you believe Mary is dead, buried, and not assumed into Heaven, you are believing something not recorded in the Bible? Now for those people who do believe in the Bible Alone, then why is there no place in Scripture that says "the Bible Alone". If Bible alone was all that significant, than why is it that there is no reference to it in the Bible. The apostle John said that Jesus did many things that were not written down. John would you also say that these things that Jesus did were insignificant because they were not recorded in the Bible? But there are also many other things that Jesus did; if every one of them were written down, I suppose that the world itself could not contain the books that would be written (Jn 21:25). However, there is still this question. Is there anything anywhere that would suggest the Assumption of Mary in Scripure. We have ample evidence for the Ascension of Jesus, but what about the Assumption of Mary. “She brought forth a male child, one who is to rule all the nations with a rod of iron, but her child was caught up to God and to his throne (Rev 12:5). The male child being caught up to God is the Ascension of Jesus into Heaven. And then we are shown what happens to the woman "the woman fled into the wilderness, where she has a place prepared by God, in which to be nourished for one thousand two hundred and sixty days" (Rev 12:6). Where is Jesus mother Mary now? He [the dragon] pursued the woman, who had borne the male child. But the woman was given the two wings of the great eagle that she might fly from the serpent into the wilderness, (13:13-15). She was assumed into Heaven. The Assumption of Mary defined November 1st 1950: Finally the Immaculate Virgin, preserved free from all stain of original sin, when the course of her earthly life was finished, was taken up body and soul into heavenly glory, and exalted by the Lord as Queen over all things, so that she might be the more fully conformed to her Son, the Lord of lords and conqueror of sin and death. The Assumption of the Blessed Virgin is a singular participation in her Son's Resurrection and an anticipation of the resurrection of other Christians (Catechism of the Catholic Church, 2nd edition, paragraph 966). This was declared by Pope Pius XII, November 1, 1950. There are some people who mistakenly believe that part of this doctrine is that Mary did not die before she was assumed into heaven. The dogma of the Assumption does not make any such distinction although; the predominant belief is that she did die before her assumption. The assumptions of Enoch and Elijah: Of course the Assumption of Mary would be another exception. It is not the norm. And so the question is this, are there examples of other assumptions in the Bible? The answer is yes. By faith Enoch was taken up so that he should not see death, and he was found no more because God had taken him (Heb 11:5). Then Enoch walked with God, and he was no longer here, for God took him (Gen 5:24). And Elijah was assumed into heaven as a sign that Elisha's wish would be granted; Elijah went up into heaven in a whirlwind (2 Kings 2:11). There are those who believe that people cannot be assumed into heaven and will say that the Assumption of anyone, including Mary, is in opposition to the Bible. But of course here you have two assumptions Enoch and Elijah that are within the Biblical text. Non-Catholics teach the ascension of Mary: Some faiths teach that the Catholic Church makes Mary into another God. They believe this in part, because the Church teaches that Mary was assumed into heaven. 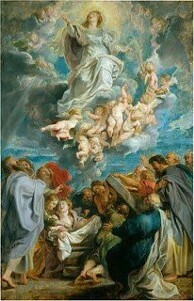 They know that Jesus ascended into heaven and to them, the Assumption of Mary is another ascension. Thus, Mary is treated as God, equal to Jesus. Their error is in ignoring the distinction between "Assumption" and "Ascension". Mary was assumed (carried) into heaven because she was human and Jesus ascended under His own power into heaven because He was God. No one takes it from me, but I lay it down on my own. I have power to lay it down and the power to take it up again. This command I have received from my Father (Jn 10:18). There are some who ignore the distinction between "ascension" and "assumption" in order to make assumption appear un-Biblical. Loraine Boettner, who wrote extensively against the Catholic Church, uses the word "ascension" in place of the word "assumption". Her [Mary's] resurrection and ASCENSION are made to parallel Christ's resurrection and ascension (Loraine Boettner, The Assumption of Mary, Roman Catholicism, Phillipsburg, New Jersey: the Presbyterian and Reformed Publishing Company, 1962, pgs 162-164.). In so doing he misrepresents the Church in order to convince people that the Catholic Church is wrong. If the Catholic Church is so wrong then wouldn't it make sense for Boettner and others to represent the Church correctly and then try to refute it. The "Ascension of Mary" is Boettner's teaching and the "Assumption of Mary" is Catholic teaching. There are a lot of brilliant Protestants out there. They know there ABC's (Anything But Catholic). Loraine Boettner has led people out of the Catholic Church through his intellectual dishonesty. In the end, he is his own undoing because he has unwittingly led many people into the Church. This happens when Protestants of good intention see this lack of honesty; they check further and find themselves drawn into the very Church they were taught to hate. Lutheran minister, why all the fuss about Mary? Although it most certainly was not true of the early Protestant reformers, it is true for many Protestants today. They claim that emphasis on Mary takes away from the centrality of Jesus. The concept that Marian teachings actually and ultimately points to Jesus is a foreign one to them. Rev. Charles Dickson, a Lutheran minister, comments on this in an article entitled; Why all this fuss about Mary? Having been raised in a traditional Protestant atmosphere, I was led to believe that Catholics placed far too great an emphasis on the Virgin Mary in their faith and practice and that such an emphasis deflected from the centrality of Christ. But in some 30 years of ministry in a Protestant tradition I have learned that just the opposite is true. By upholding the importance of the Blessed Virgin, Catholics do not minimize the importance of Christ, but actually emphasize and underline His mission... When the Church ceases to focus on Mary, it loses its focus on Christ. That's the reason for all the fuss about Mary... As Protestant theologian J. Gresham Machen admitted, 'The overwhelming majority of those who reject the Virgin Birth, reject also the supernatural content of the New Testament '(Rev Charles Dickson, "Why all the Fuss about Mary?, Marian Helpers Bulletin, June/July 1992, pg 10). Where are the Bones of Mary? We have the bones of Buddha, we have the bones of Mohammad but no-where are we to find the bones of Jesus. No church has ever claimed that they have the bones of Jesus. This is used as a supporting argument for the Resurrection and the Ascension of Jesus because if He didn't rise from the dead and ascend into Heaven, where are His bones. Bones and other remains of Saints are called relics. The word relic comes from the Latin "relique" meaning remains. Bones were highly reverenced in the history of the Church. Joseph gave instructions about his bones (Gen 50:25). Moses took the bones of Joseph along with him to Egypt (Exod 13:19). We are also told where these bones are buried (Josh 24:32). When a dead man was thrown on to the bones of Elisha he came back to life (2 Kgs 13:21). There is a reference to gathering up the bones of Saul as well as others (2 Sam 21:13). A man of God who was disobedient to God, as a punishment, would not allow him to be buried with his ancestors (I Kgs 13:21-31). In the new Testament we have the bones of Mathew, Mark, Luke, and John as well as many others who lived at the time of Jesus and we even have the bones of Mary's mother Anne, but we have no bones of Mary. Even though the bones of the early Saints were highly prized among the Churches, no Church has ever claimed to have the bones of Mary. If any Church did have the remains of Mary it would have been considered a great treasure. Just as the fact that we don't have the bones of Jesus is a supporting argument for his Resurrection and Ascension; the fact that we don't have the bones of Mary is a supporting argument for the Assumption of Mary. We do not have the remains of Mary; however, we do have the location where she was assumed into heaven and on this site a Church was built, the Church of the Dormition. The mighty one has done great things for me. Mary has said of herself that The Mighty One has done great things for Me (Lk 1.49). One of the great things that God had done for her, was of course, the privilege of being the mother of God. But what are the other things? Could one of the other things be the Assumption of Mary? In his little book, Daughter Zion, Ratzinger points out that the dogma of the Assumption takes its rise from doxology. It is a solemn form of hymnology, an act of Marian veneration in the form of a dogmatic statement. Hence we should not look for historical evidence, as in the case of the resurrection of Jesus. Yet the dogma is grounded in the affirmations of faith. It fulfills both the biblical prophecy, 'behold, henceforth all generations will call me blessed' (Luke 1:48), and the words of Elizabeth, 'Blessed is she who believed' (Lk 1:45). These texts give a special applicability to Mary of the teaching of Ephesians that God raises up the baptized with Christ and raised us up with him and seated us with him in the heavenly places in Christ Jesus (Eph 2:6), (Dulles, Avery. "The Dogma of the Assumption." The one Mediator the Saints and Mary, Lutherans and Catholics Dialog Vifi. George Anderson, Francis Stafford, Joseph A. Burgess. Minneapolis: Augsburg Fortress, 1992 pgs 279-294). The oldest records of the assumption of Mary, 100 to 200 A.D. The assumption of Mary was always believed in the Church. The Eastern Orthodox Churches and the Catholic Church believe in Mary's assumption and both have traditions that go back to the time of Christ and the Apostles. In 1950 Pope Pius the XII raised it to the level of dogma. There are some people who believe this was a new doctrine that was never before believed in the Church prior to 1950. Of course the Assumption of Mary was believed long before this. In 600 A.D. the emperor Marice decreed that the feast of the assumption was to be observed on August 15 in Constantinople. One of the oldest shrines in the Holy Land is the Church of the Dormition (loosely "long sleep"), the spot venerated from which Mary was assumed into heaven. This church dates back to the 5th century. Writings containing the Assumption go back to the very earliest Church. These early Christian writings called the Transitus or the passing of Mary date back to 150 to 300 A.D. The Syrian fragments date as far back as 100 to 200 A.D. The passing of Mary stories were like novels written today that have for their setting some fact of history. For example, novels written about World War II would not be true stories, but would have some truth in them because they have for their setting World War II. This is factually true even though the story itself would not be true. The kernel of truth here is the fact of World War two. The Transitus has for it's setting the Assumption of Mary and the kernel of truth here is of course the Assumption. There are some who mistakenly maintain that the Assumption has for it's source the Transitus. This of course is not true anymore than we would say that World War II has for its source a novel written on World War II. The Transitus has for it's setting the popular belief in the Assumption of Mary in the early Church. Rapture/Assumption or is it both? Terry Frazier a convert from Evangelical Fundamentalism contrasts the Assumption with the Rapture. I began to see it [Assumption] was very similar to the Evangelical doctrine of the rapture where, at the end of time, Christ snatches living Christians off the face of the earth, glorifies them, and transports them both body and soul into heaven. The same idea of being physically snatched away into heaven before the general resurrection lies behind both the Assumption and the rapture. There seemed little reason to say that the rapture was scripturally feasible while maintaining the Assumption wasn't (T.L. Frazier, Assumptions about Mary, This Rock Magazine, Karl Keating San Diego, May/June 1992). In other words, if Mary being carried into Heaven body and soul is not Biblical, then the rapture where millions allegedly would be carried body and soul into Heaven, could not be Biblical. Terry was taught as a Protestant that 1 Corinthians precluded the possibility of Mary's assumption. For as in Adam all die, so in Christ, the first fruits; then, when He comes, those who belong to Him (1 Cor 15:22-23). Terry realized the obvious; if this verse rules out the possibility that Mary could be taken bodily into heaven before the second coming, then wouldn't it also rule out the possibility of a rapture occurring seven years before the Second Coming (T.L. Frazier, Assumptions about Mary, This Rock Magazine, Karl Keating San Diego, May/June 1992). This and other contradictions were part of the reasoning behind Terry's moving away from Evangelical Fundamentalism. It just didn't add up. Many deny the Assumption of Mary because they do not find it in the Bible and yet they accept the rapture even though it is not in the Bible. Some people are led to believe that the Assumption was never taught in the early Church and yet at the same time they follow one of the many contradictory versions of rapture. The irony here is that the Assumption of Mary was believed in the early Church, and no church prior to 1830 believed in the rapture. Do Catholics worship Mary as a God? Why do you have false gods and why do you worship Mary as God? A Southern Baptist made this angry allegation to a Catholic friend at a wedding reception. The person not knowing exactly what to say and not wishing to get in an argument walked away. As for myself, I don't think I would have walked away even at a wedding reception. I would have taken the time to explain that the worship of Mary as God is not a Catholic teaching but a Protestant teaching about Catholicism. It is true that Mary is given an honor (hyperdulia) greater than that of the rest of the saints (dulia); however, the greatest honor or worship (latria) is always reserved for God. The Catholic Church should be represented accurately before being criticized so that the critics won't be just disagreeing with their own misrepresentations. Why do Catholics honor Mary so much? While writing this letter someone asked me the question Why do Catholics honor Mary so much? The question is a very good one because the Catholic Church does honor Mary so much. Honoring Mary can be found in these Bible verses. The angel of the Lord honored Mary. Hail, favored one! The lord is with you (Lk 1:28). Elizabeth honored Mary, Most blessed are you among women, and blessed is the fruit of your womb. And how does this happen to me, that the mother of my Lord should come to me (Lk 1:42-43)? Jesus honored Mary when He worked His first miracle at the request of Mary even though he initially objected (Jn 2:3-10). Simeon honored Mary when he said, And you [Mary] yourself a sword shall pierce so that the thoughts of many may be laid bare (Lk 2:35). Mary is honored in every generation, from now on all ages will call me blessed (Lk 1:48). Martin Luther exalts Mary, his "spiritual mother". It is the consolation and the superabundant goodness of God, that man is able to exalt in such a treasure. Mary is his true Mother.. (Sermon, Christmas, 1522). Mary our Spiritual Mother: Luther gives the Blessed Virgin the exalted position of "Spiritual Mother" for Christians: Mary is the Mother of Jesus and the Mother of all of us even though it was Christ alone who reposed on her knees . . . If he is ours, we ought to be in his situation; there where he is, we ought also to be and all that he has ought to be ours, and his mother is also our mother. (Sermon, Christmas, 1529). Luther honors Mary: She is the] highest woman and the noblest gem in Christianity after Christ . . . She is nobility, wisdom, and holiness personified. We can never honor her enough. Still honor and praise must be given to her in such a way as to injure neither Christ nor the Scriptures. (Sermon, Christmas, 1531). No woman is like you. You are more than Eve or Sarah, blessed above all nobility, wisdom, and sanctity. (Sermon, Feast of the Visitation, 1537). One should honor Mary as she herself wished and as she expressed it in the Magnificat. She praised God for His deeds. How then can we praise her? The true honor of Mary is the honor of God, the praise of God's grace . . . Mary is nothing for the sake of herself, but for the sake of Christ . . . Mary does not wish that we come to her, but through her to God. (Explanation of the Magnificat, 1521). In his sermon of August 15, 1522, the last time Martin Luther preached on the Feast of the Assumption, he stated: There can be no doubt that the Virgin Mary is in heaven. How it happened we do not know. And since the Holy Spirit has told us nothing about it, we can make of it no article of faith . . . It is enough to know that she lives in Christ. The question should not be, why do Catholics honor Mary so much? The question should be why do some Protestants honor Mary so little when in fact, the Bible honors Mary so much. Here is another question. Why do some Protestants honor Mary so little when the early Protestants (especially Martin Luther) honored Mary so much? More citations of Luther listed at www.BiblicalCatholic.org. Sometimes I am hard on Protestants because they don't honor Mary. On the other hand there are Protestants such as Rev. Charles Dickson, who honor Mary a great deal and see no conflict between Jesus and Mary, but see Jesus and Mary working together as ONE, just as it says in the Bible; So that they may be ONE, as you, Father are in me and I in you, that they may also be in us... And I have given them the Glory you gave me, so that they may be ONE, as we are ONE (Jn 17:21-23). If we are given the glory that the Father has given to Jesus, is Mary to be excluded from that Glory? Are we included in this oneness and Mary excluded? And if Mary is included in this then it's not Jesus or Mary, but it is both Jesus and Mary and all of us working as one with the Father and the Holy Spirit. People who say it is Jesus or Mary pick one or the other as though there is some type of conflict between them, are not following the Bible. They are following their tradition. In summary the Assumption was believed in the early Church. There are other examples of people being assumed (Enoch and Elijah). No Church claims to have the bones of Mary. We have the location where Mary was assumed into heaven (Church of the Dormition). Both the Church of the East and the Church of the West, who have a history that goes back to the time of Jesus and the Apostles, believe and teach the Assumption of Mary. John, you question the authenticity of the Assumption of Mary by saying, that is quite an assumption. I would only respond by saying, Mary's assumption is quite the Assumption.